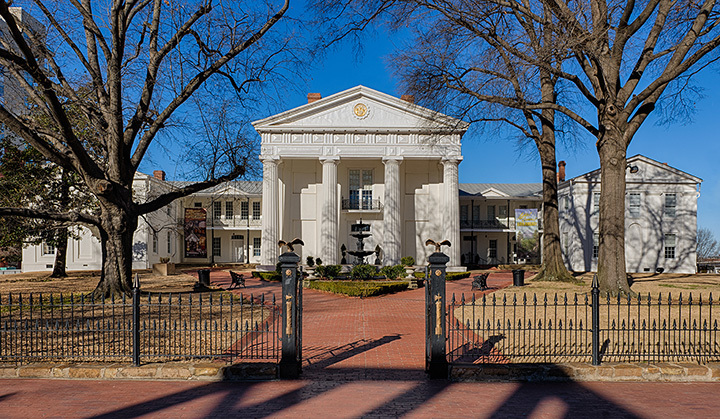 The Top 15 Historical Sites in Arkansas! Hundreds of spots across the state of Arkansas are preserved for their historical significance. From historic court houses, to famous wine cellars, to incredible archeological sites, Arkansas has a little bit of everything. So if you’re interested in digging a little deeper into the roots of the Natural State, check out these 15 excellent historical sites. Construction began on the Old State House in 1833 and served as the first state capital building of the Natural State until the Arkansas State Capitol Building took over in 1911. It remains the oldest state capital building west of the Mississippi River that is still standing. The Old State House in Little Rock, Pulaski County, was added to the National Register of Historic Places on Dec. 3, 1969. Constructed between the years 1873 and 1875, Old Main is the oldest building related to the University of Arkansas in Washington County, Arkansas. Designed by Chicago architect John Mills Van Osdel, Old Main is a brilliant example of Second Empire architecture. Those who constructed Old Main used local materials as the nearest river and railroad were not within the range of convenient locations. Lumber was brought in on oxen-drawn wagons from the Peter Vanwinkle Sawmill near War Eagle in Benton County, and bricks were made from clay dug from the campus grounds that were fired in temporary kilns on site. It was added to the National Register of Historic Places on June 15, 1970. The 1877 survey marker 48 is a boundary marker showing the state line between Arkansas and Oklahoma, or what was Choctaw Territory. Open to the public, it is one of very few markers that remain from the 1877 land survey to determine Indian Territory boundaries. It is located near Mena in the Ouachita National Forest on Talimena Scenic Drive. The marker is made of an octagonal cast iron pipe and is engraved with a directional legend. The State Line Marker was added to the National Register of Historic Places Nov. 18, 1976. Due to the large number of convicts he sentenced to death by hanging, Judge Isaac Charles Parker became known as the “Hanging Judge” of the Old American West. The hanging gallows still stand today and are a popular tourist destination. This historic site was added to the National Register of Historic Places in 1999. Spreading across multiple counties are eight historic sites that were used for military purposes during the American Civil War as part of the Red River Campaign under General Frederick Steele. Each of the eight sites is listed separately on the National Register of Historic Places. These sites were designated as a National Historic Landmark District on April 19, 1994. This is the perfect sight-seeing experience for history buffs interested in war. The boundaries of this historic site were roughly set by Dr. Martin Luther King, Jr. This centennial neighborhood, which is mostly residential, was added to the National Register of Historic Places on Aug. 16, 1986. The most notable structure within the district is Little Rock’s Central High School, known worldwide for its role in the 1957 school desegregation crisis. If you don’t remember this from your history books, then perhaps you remember its mention in the blockbuster move Forrest Gump. This 19th century landmark was built in 1868 and is named for United States Army General Benjamin Louis Eulalie de Bonneville (1796-1878). Other local spots named after Bonneville include Fort Smith’s Bonneville Elementary School, the Bonneville Salt Flats, and the Bonneville Dam. The Benjamin Bonneville House in Fort Smith was added to the National Register of Historic Places in 1971. Today the Benjamin Bonneville House advertises itself as a unique special events location. It is said that Native Americans built these magnificent mounds in the Lower Mississippi River Valley between the years 650 and 1050 AD. This 100-acre site is one of the largest archaeological sites in Arkansas. The Toltec Archaeological State Park was added to the National Register of Historic Places on Jan. 12, 1973 and designated as a National Historic Landmark on June 12, 1978. After emigrating with his family from Switzerland, Johannes Andreas Wiederkehr, the winery’s founder, dug this historic wine cellar by hand. Today the Wiederkehr Wine Cellar houses the Wiederkehr Restaurant which serves authentic Swiss and European cuisine. This site is located on the Wiederkehr Winery property in Franklin County and was added to the National Register of Historic Places on May 2, 1977. These eight bathhouses were built in the Hot Springs National Park in the iconic city of Hot Springs between the years 1892 and 1923. Famous for their healing waters, the natural hot springs found here have been used since prehistory. It is thought that Hernando de Soto may have visited this area in 1541. Bathhouse Row was added to the National Register of Historic Places on Nov. 13, 1974 and was designated as a National Historic Landmark on May 28, 1987. Nestled in Crawford County between the Arkansas River and Van Buren’s train station is an eight-block neighborhood with a significant commercial history in this area. One of the oldest buildings in Arkansas is in this district, the Albert Pike School. The log schoolhouse was used by famed attorney, Freemason, teacher, and soldier Albert Pike (1809-1891). The Van Buren Historic District was added to the National Register of Historic Places on April 30, 1976. The house that Judge Jonas Tibbetts, an outspoken Union supporter, built was occupied by the Union during the Action at Fayetteville in the American Civil War. Headquarters House was a Confederate target and was damaged when a cannonball hit the front door. Headquarters House, located on East Dickson Street, was added to the National Register of Historic Places on June 24, 1971. Reflecting the development during the first century of the Shiloh-Springdale community, the Shiloh Historic District includes 18 structures and 12 sites, as well as traces of historical roads. Shiloh Church, at the district’s center, was built in 1870 and is the oldest standing building in Springdale. The Shiloh Historic District in downtown Springdale was added to the National Register of Historic Places on Aug. 31, 1978. The Parkin site, also called the Parkin Indian Mounds, is believed by many scholars to be the aboriginal village the Provence of Casqui. It is said that this area inhabited by the Casqui people was visited by Hernando de Soto in the early 1540s. This Cross County historical site was designated as a National Historic Landmark on July 19, 1964 and was added to the National Register of Historic Places on Oct. 15, 1966. The first oil well in the Natural State was drilled in 1887 in Fort Smith but oil wasn’t found until the Hunter Oil Company moved onto the Lester-Haltom lease near Stephens. The first much-anticipated discovery of oil in Arkansas happened on April 20, 1920, when the Lester and Haltom No. 1 Well “blew.” This historic site is located just off Old Wire Road near Stephens in Ouachita County and was added to the National Register of Historic Places on April 3, 1976. View more Arkansas Historical Sites.